Uncategorized | 2009 SL® Footwear Expo! Hey everyone! We’re halfway through the fair and I thought it’d be a great time for an update on how we’re doing for the Marine Toys for Tots! We’re currently sitting at just shy of 500,000L, and as my goal is 1m linden, it’s about halfway there! Show your support for the kids and for the amazing shoe designers at the fair, and come on down to check out the shops. You never know if you’ll find that awesome designer you’ve never heard of before! Did Ch’naux That Alicia Is DJ’ing? Okay, that was an extremely bad pun. But it sorta fits, as Alicia is a fun sort of blogger in addition to being a DJ. There are tons of wonderful prizes and there will be 2 winners this year! Price is L$1000 per ticket, enter as many times as you like, and keep your eyes open for the winner announcement at the end of the Expo! Please IM Rosie Shark with any questions! Did You Know about the Raffle?? Yesss! It’s true! Scattered all over both sims at the Footwear Expo you will see the ornaments shown above. The red one will allow you to donate any amount. The green one is to purchase a raffle ticket. Why purchase a raffle ticket, you ask? 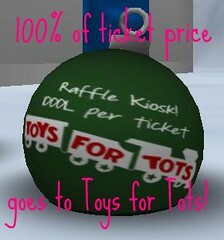 Well, aside from the awesometastic prizes, your L$1000 to purchase a ticket will go entirely to Toys for Tots. And now for the OMG prizes! This year there will be 2 winners. A grand prize winner and a runner up. So, Goooooooooo! Look for the green ornaments and get your tickets! QUICK! Winners will be drawn randomly at the end of the fair. Contact Rosie Shark for details! G Field & Slash Me! It’s been over a day, and I keep putting these gorgeous Long Fur Cuff Boots on from G Field! With the thick heel and the fluffy fur cuff, it’s just perfect for the winter months to come. They come in 9 colors for $180L each, or a fatpack for just $900L. Also, at the Shoe Expo, you can find the special Holiday Red color, with 100% of the proceeds of that color going to Toys For Tots. Awesome! At the Expo, you can also find this fun pose by Slash Me poses! All dates and times subject to change. IM Rosie Shark for details. Any updates and additional performances will be communicated via the blog. Come down and enjoy! And thank you to the entertainers of this year’s expo for their participation! …Is Kafka Dinzeo, better known as Microcka, from Chicago! For styling information please visit On Your Toes Blog.